Besides the integration of knowledge users into the production of new action-oriented knowledge, other linkage and exchange interventions exist to facilitate the use of pre-existing research. Educational Outreach Visits: a personal visit by a trained person to health professionals in their own setting. 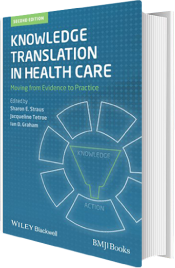 Its key principles include surveys of practitioners to determine barriers to appropriate practice and the subsequent development of an intervention tailored to address these barriers using simple messages. Opinion Leaders: the degree to which an individual is able to influence other individuals’ attitudes or overt behaviour informally, in a desired way with relative frequency. Cognitive Cues – represent interventions to remind or prompt practitioners to take evidence-based action at appropriate times. What linkage and exchange interventions can be used to positively influence knowledge use? that relevant stakeholders have the opportunity to be equitably involved at all appropriate stages of the process. The participatory approach integrates knowledge translation within the knowledge creation process by ensuring that those who have identified the gap are themselves taking ownership of the process of bridging it. Key drivers of the participatory process include following the knowledge-to-action cycle and stakeholder self-determination; partnership stages include stakeholder engagement, formalization, mobilization, and maintenance.